This adventurous morning dive trip usually visits one of our deeper locations for the first dive such as the famous Sea Tiger, YO-257 or San Pedro. On this dive, you will able to dive to one of Oahu's famous wreck like the Sea Tiger, YO-257, San Pedro. We dive all the major wrecks on the South and South/East Shores. On the second dive, you will visit one of Oahu's reefs teaming with sea turtles, moray eels, sting rays, and other abundant marine life. PADI 5 Star Gold Palm Resort Facility with two dive boats and dive center in Waikiki. Knowledgable and experienced staff are dedicated to making your dive experience in Hawaii safe and fun! Your dive day begins at 7:00 am meeting at our dive shop located in Waikiki. Or if you need pickup from your Waikiki hotel at 6:45 am. Then you will be transported to our dive boats about 20 minutes away near Hanauma Bay or Kewalo Boat Harbor. Your gear will be set up for you when you arrive at the boat if you are using our rental equipment or the crew can set up your gear if you bring it from home. After a safety briefing, you're off to one of our 30 dive sites to see wrecks, giant sea turtles, white tip reef sharks, moray eels, octopus, thousands of tropical fish (some only found here in Hawaii) and other abundant reef life. 2. 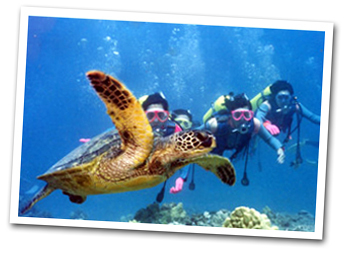 PADI 5 Star Gold Palm Resort Facility with two dive boats and dive center in Waikiki.